It’s cliche to say “you never know who is going to win in college sports.” But it’s true, you really never know who is going to win. The Pac-12 this season has not been linear — in fact, I would compare it to a roller coaster with flips and corkscrews. Coming into the season, many fans had already played out the different scenarios that they felt could happen. While the top of the Pac has been consistent all year, the rest has not. Let’s take a look at five different headlines that every fan of the Pac-12 should be thinking about. 1. The Arizona Wildcats are winning the division. 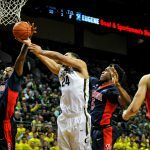 Arizona defends a Dillon Brooks lay-up. As many expected before play started, Arizona is holding its grip on the top of the Pac. The Wildcats are loaded with depth, from young athletic guys to guys with monster size. Arizona really does have it all, and it’s showing thus far. The Wildcats did suffer a tough loss to in-state rival Arizona State, but recovered nicely with wins over Washington and Washington State. Right now, the Wildcats would not be slated as a No.1 seed for the tourney, but they do have time to win some more games and stake their claim for one of the four top seeds. Arizona plays a struggling USC team on Thursday before taking on UCLA on Saturday. 2. The Huskies are not the best team in Washington. Young looking to get rid of the ball. When you read this headline, you will think to yourself: “Of course not, because Gonzaga University is literally dominating all of its opponents.” From a Pac-12 perspective, however, the Washington Huskies always take home bragging rights for the state of Washington. This year is a little bit different — the Huskies are 3-10 in conference play, while the Cougars from Washington State are 5-8. Even though the Huskies are 14-11 overall while the Cougars are 11-14, neither team is vying for a tourney spot at the moment. The Huskies are definitely this year’s Pac-12 bust, as they are underachieving in every facet of the game. 3. 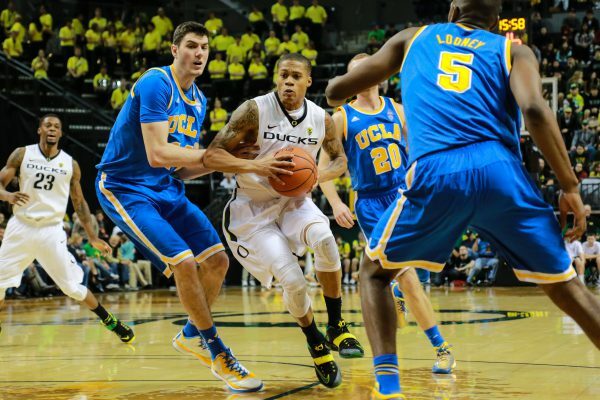 UCLA seems to be turning its fortunes around, having fought inconsistency the entire season. The Bruins defending a driving Joe Young. A few weeks ago, many people had the Bruins in the bottom half of the Pac-12. The talent is there, the coaching is there — they just could not seem to pull it together. All of a sudden, something sparked for the bears from Westwood, California. They have gone on to win five of their last six games, with the lone loss courtesy of the California Bears. No school in college basketball today has the legacy that UCLA does. They are expected to compete year in and year out. With this year starting out rough, the Bruins have changed things around and are now viable contenders for a playoff spot, if and only if they continue on their path of recent success. The Bruins are set to take on the Sun Devils in Tempe, Arizona tomorrow. We have already talked a lot about the Wildcats, and their exceptional play this season. Now, it’s time to look at the No.2 team in the Pac-12, and No.11 overall – the Utah Utes. Most fans expected the Utes to be very good, but the success they have had thus far has been phenomenal. (Just take a look at highlights from their big upset win over Wichita State earlier this season.) The Utes boast a 20-4 overall record, and are a clear three or four seed in the tourney as of right now. The Utes head to Corvallis on Thursday to take on the struggling Oregon State Beavers, and are then off to Eugene to face our beloved Ducks. 5. Save the best for last…. the Ducks are pretty good this year. Joseph Young eyeing his opponent. 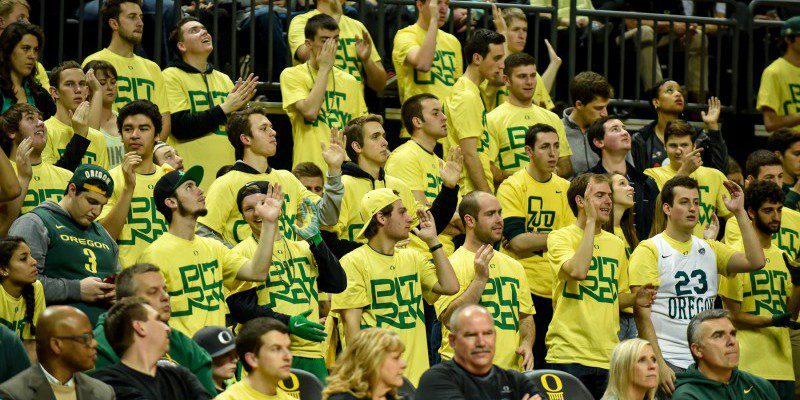 From someone who goes to school here at the University of Oregon, I was not expecting much from the Ducks. Losing three would-be starters before the season starts is tough, subsequently placing all the pressure on Joseph Young. While Young is currently leading the Pac-12 in scoring, the rest of his teammates are really coming through. Jordan Bell blocks almost every shot that comes his way, Dwayne Benjamin is starting to play well, and Dillon Brooks has a ton of promise. 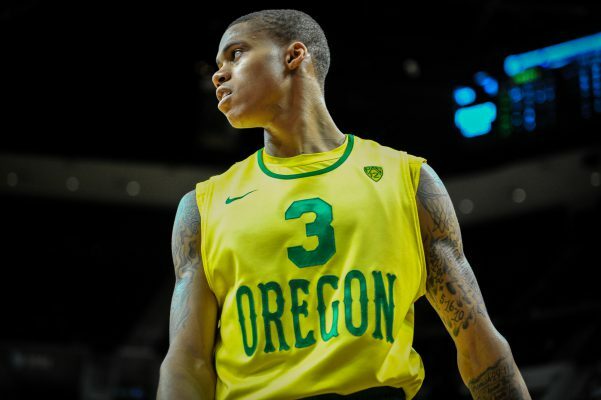 Inconsistency has been a big factor for the Ducks thus far, and if they hope to get into the tourney, they need to play well from here on out. 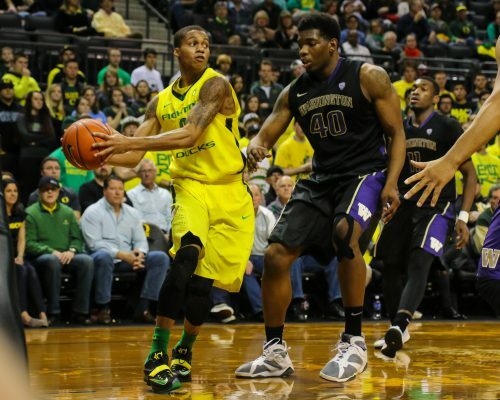 The Ducks are set to take on the Colorado Buffaloes tomorrow, and then the Utes on Sunday. The Pac-12 has certainly been a roller coaster ride this year. From Arizona dominating everyone to UCLA making a huge jump these past few weeks, you never know what to expect with college basketball. The next few weeks should be interesting, as there are some very key pairings to watch. The Pac-12 has no No.1 seeds as of right now, so playing well from here on out will go a long way in showing that the Pac-12 does deserve the title as a top conference in college basketball.